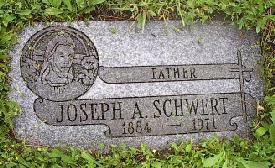 Joseph August Schwert1 was born on November 29, 1884, in Buffalo, New York. He was baptized on November 30, 1884, as "Joseph Johan" by Fr. Ferdinand Kolb of Saint Boniface R.C. Church, 124 Locust Street, Buffalo. Joseph was wed to Florence M. Clark. The couple resided at 10 Edna Place in Buffalo. Social Security records indicate that Joseph was employed by Metropolitan Life Insurance Company. Florence died of cerebral thrombrosis on January 9, 1960. Joseph died on November 2, 1971, of a heart condition. 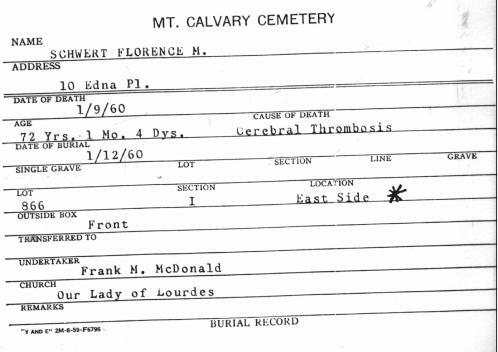 He and Florence are interred in Section I, Lot 866, Mount Calvary Cemetery (Pine Hill), Cheektowaga, NY. 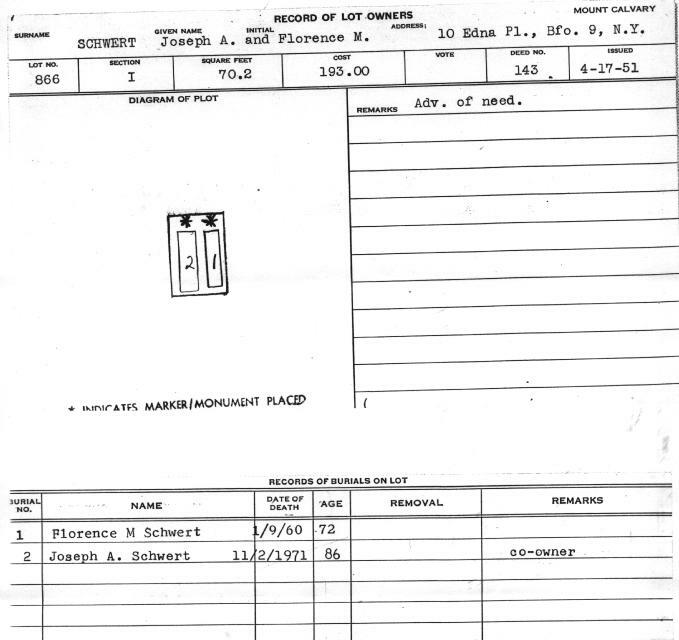 1This "Joseph August Schwert" (son of John and Augusta [née Lorenz] Schwertfeger/Schwert; Social Security #070-05-9530) should not be confused with his cousin, "Joseph August Schwert," (son of Franz Carl and Julia [née Schlia/Schlee] Schwertfeger/Schwert; Social Security #122-05-0871). Florence (née Schwert) Bronson: Born 1908; died 1975. Margaret (née Schwert) Fick: Born 1911; died 1978. Graves of Joseph August and Florence M. Schwert, Section I, Lot 866, Mount Calvary Cemetery (Pine Hill), Cheektowaga, NY. 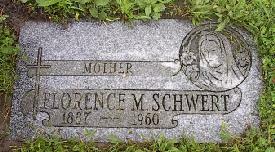 Grave of Florence M. Schwert, Section I, Lot 866, Mount Calvary Cemetery (Pine Hill), Cheektowaga, NY. 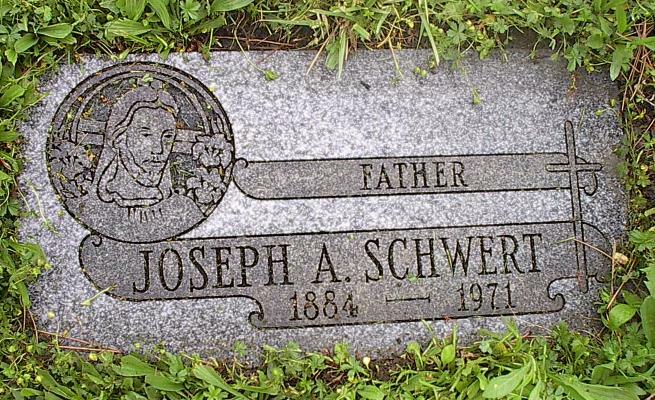 Grave of Joseph August Schwert, Section I, Lot 866, Mount Calvary Cemetery (Pine Hill), Cheektowaga, NY. Baptismal Record: Joseph August Schwert, born on November 29, 1884. Baptized on November 30, 1884, as "Joseph Johan" Schwert, at Saint Boniface R.C. Church, Buffalo, NY. 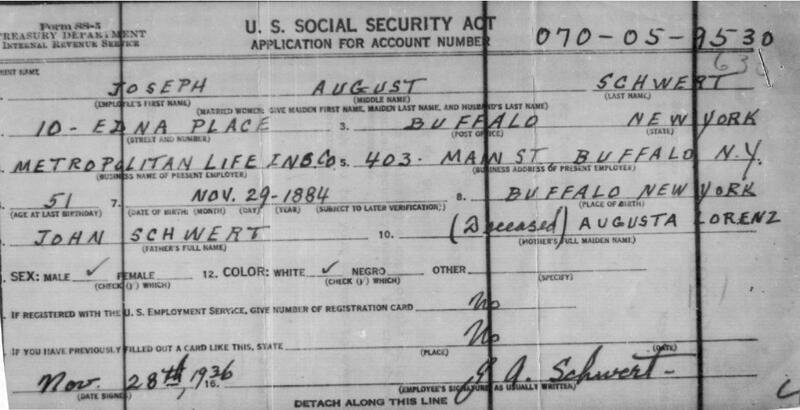 Social Security Application: Joseph August Schwert, November 28, 1936. 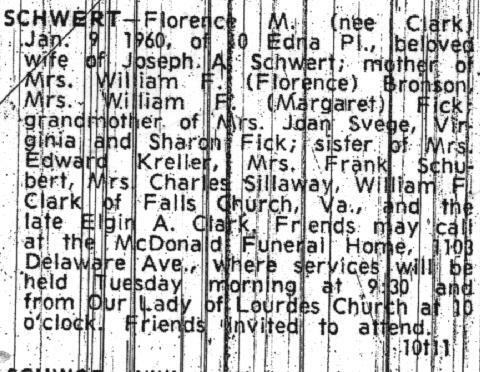 Obituary: Florence M. (née Clark) Schwert, January 9, 1960. Interment Record: Florence M. (née Clark) Schwert, Mount Calvary Cemetery (Pine Hill), Cheektowaga, NY. 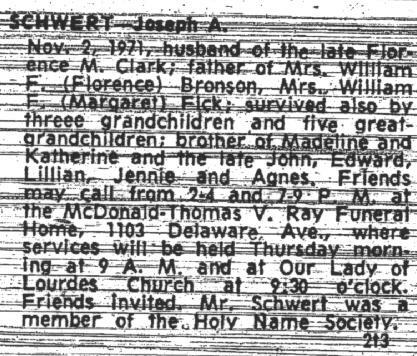 Obituary: Joseph August Schwert, November 2, 1971. 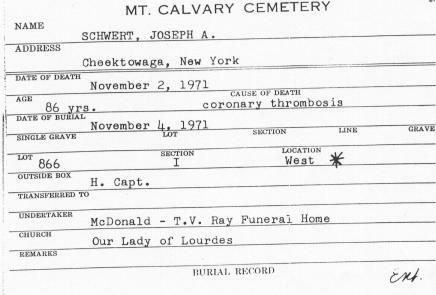 Interment Record: Joseph August Schwert, Mount Calvary Cemetery (Pine Hill), Cheektowaga, NY. Cemetery Plot Record: Joseph August and Florence (née Clark) Schwert, Mount Calvary Cemetery (Pine Hill), Cheektowaga, NY.